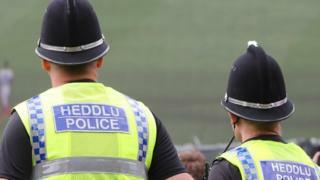 Two North Wales Police constables have been dismissed - one for harassment and the other for drink driving. Stuart Bradshaw, 32, from Deeside, and Neil Bebbington, 48, from Buckley were found guilty of gross misconduct in separate disciplinary hearings. Bradshaw was found to have "an unhealthy obsession" with his ex-girlfriend, while Bebbington drove while over the legal alcohol limit. Neither were present at the hearings in Colwyn Bay. Bradshaw had recently been given a 12 week suspended sentence and a five year restraining order which bans him from contacting his ex-girlfriend. The disciplinary panel heard he had accessed her social media account 257 times and sent her gifts. Last month Bebbington pleaded guilty to being more than twice over the legal alcohol limit when driving to work in St Asaph. Magistrates banned him from driving for 18 months and fined him £500.